At the risk of sounding like I’m bragging, I earned a PhD in Adult and Continuing Education over 20 years ago. Since then it’s hard for me to sit in CE classes on any topic and not critique the development of the subject, the presenter(s) style, visual materials, exercises, virtually everything that goes into creating a CE event. There are two reasons for my assessment activities. One is that I’ve either taught it or learned it before (several times in some cases) so I get a little bored. Two, I like to improve my own knowledge and skills by assessing what is being done well and what is not. Yes, I’ll admit that makes me a bad student, somewhat like MDs make bad patients. But it makes me no different than the other attendees who aren’t all there mentally because of issues back at the library, or at home, or where ever they’d rather be. Another element of these CE events regards the trainer him/herself, and whether or not they are a librarian. I recently attended a workshop on a topic relevant to librarians who work directly with the public, or with their customers, but it was presented by a non-librarian “professional” trainer. The person had their own firm of consultants, had a fairly good resume of national presentations and significant customers. But I still watched and listened and wondered – How? Why? Frankly, the presenter was so much like me in terms of mannerism, demeanor, voice inflections and rate of speaking that I was even more puzzled how they got this contract to present, let alone earned a living and employed other consultants. The words “uninspiring” and “bland” came to mind. But the thing that really puzzled me was Why are librarians being presented with “generic” material, rather than “library specific” examples and framework for this topic? I immediately thought of two well qualified and highly capable “career librarians” who could have done a much better job, AND also provided that librarianship credibility, which I think is essential in librarian CE, while presenting a much more effective and entertaining workshop. After some reflection, I reminded myself that there are two essential elements that make an effective teacher/trainer. 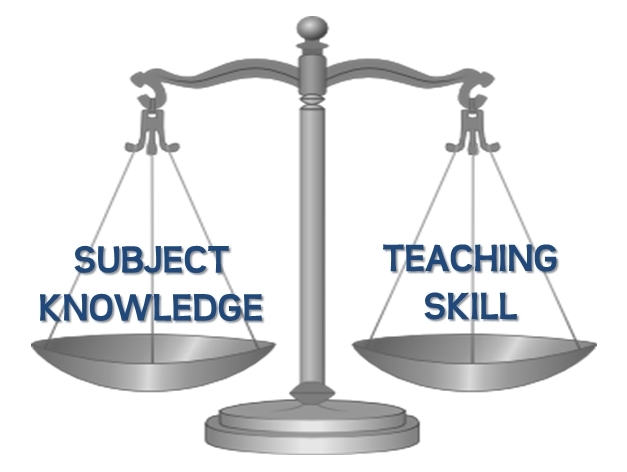 One is knowledge of the subject, and the other is skill as a teacher/trainer. Often times many people have one or the other in unequal proportions, but not both in equal proportions and adequate levels of strength to be really effective. On a balance scale it should look like this. This is where the decision to go with a non-librarian comes into consideration. Presumably, the “professional librarian” has the necessary Subject Knowledge, but may not have the necessary Teaching Skill. That presents a dilemma. Does one choose abundant Subject Knowledge combined with weak Teaching Skill, or does one choose abundant Teaching Skill over weak Subject Knowledge? My bet is we have all been recipients of both types of CE workshops. Which is more important; great Subject Knowledge, or great Teaching Skill? Would you rather sit in an all-day CE workshop with someone who knows all about librarianship, but is an ineffective trainer, or sit in one where the trainer is very entertaining, but has very little grasp of librarianship and tries to make their topic generic enough to fit the library? I’d rather have the interesting teacher, because I know how to integrate what I know about librarianship into many other areas of training, and I would rather have the non-librarian position in order to have an outsider view of the subject, which might make it easier to have conversations with staff on the subject by referencing the outsider opinion in order to allow for a more frank discussion. Thanks, that’s an excellent point. However, in my experience non-librarian trainers tend to know little or nothing about librarianship, and their efforts to try to present the subject in a library context turns some people off, and in some cases is misinformation, which some folks will accept because the trainer is a presumed “expert” on the subject. At least if you don’t learn anything you’ll be entertained.